The red vessel sink that is central to the design for the powder room arrived yesterday and it is HORRIBLE. The foil was peeling off, leaving some of the glass and some nice aluminium exposed, which might go with the stainless steel doorknob or might look like NASTY OLD CHIPPED CHROME. Described as deep cherry red it turned out to be a sickening shade of puce. This is not the look I was going for so I'm returning it. 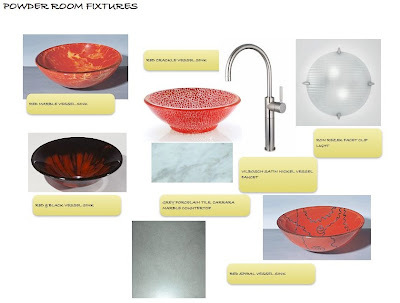 I need to pick another sink asap and I've narrowed the choice of vessel sinks to four, all by Ronbow: Red Crackle; Red & Black; Red Spiral; and Red Marble. I'm asking you to help me decide. Click on the links for a full description of each or just look at the mock-up below and tell me which will sit best in the renovated powder room? Remember this will be the only spot of colour in an otherwise monochromatic palette. The other materials are: black vanity with a Carrara marble countertop, chrome faucet and hardware, chrome framed mirrors, grey porcelain tiles with white and black veins. The hottest red vessel sink?